Earlier this month the 2013 eTextiles Summer Camp event took place in Paillard France, generously hosted by Paillard Centre d’Art Contemporain & Résidence d’Artistes and meticulously organised by Mika Satomi and Hannah Perner-Wilson of Kobakant. 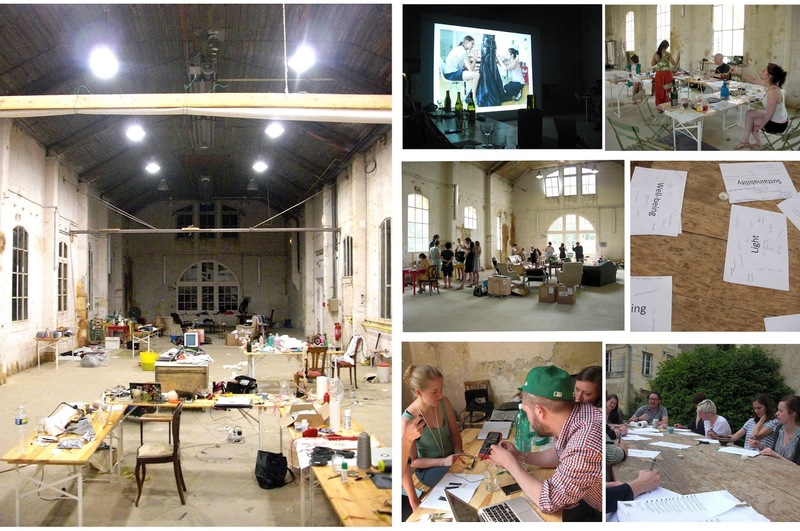 Five full days of packed e-textiles thinking, doing, making, talking and sharing amongst some of the most enthused and involved e-textile practitioners/ artists/ designers/ researchers and techies. The theme for this year's event was based on 'soft and slow e-textiles', where the focus was on making processes involving time intensive craft methods and hand making in collaboration with new technologies.The working space and local environment was perfect for such an event and could not have been more apt as was far removed from modern lifestyles and ubiquitous communications. As a means of introduction all the participants gave a five minute presentation of their work in pecha-kucha style over our first group dinner. 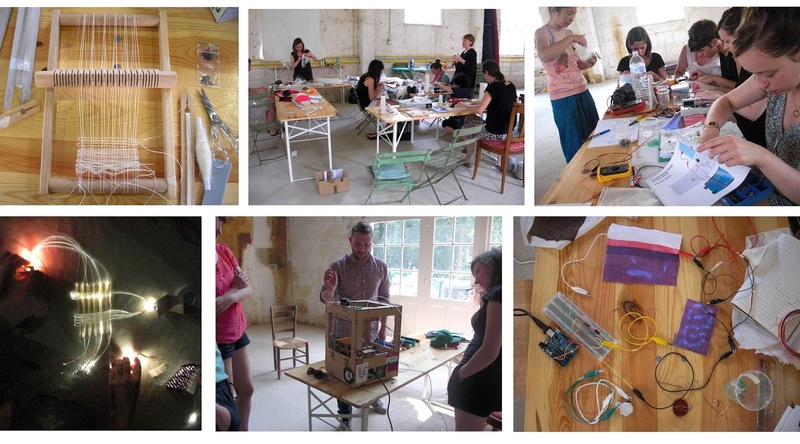 It was quite overwhelming to know that everyone in the room shared the same interests in e-textiles and there was a positive understanding, acceptance and appreciation of the type of work being executed by all. Two further days were filled with e-textile workshop activities and skill sharing. Pre-selected participants organised and led these workshops to disseminate their specific skill set and share their knowledge. Participants taking part in the workshops were able to learn skills such as Arduino programming, heatable e-textile circuits, 3D printing for e-textiles, vinyl cutting, fibre optic weaving, thermochromic screen-printing, copper batik e-textiles, conductive lace making, e-textiles touch pad surfaces to name a few! It was quite a rare opportunity to have such a diverse range of expertise all in one place with the openness to teach and learn from one another. After exploring a range of e-textile techniques and some lengthy discussions about the processes of these methods and brainstorming future potential applications of such materials, the participants were given an opportunity for group projects. Based on the topics of discussions and new ideas thought about since, several group project concepts evolved; including a 'power generating e-textiles', 'magic e-textile carpet', a 'tree loom', a 'live global e-textile swatch book' and 'underwater e-textiles hats' were some of the inventions pursued. Weft-Lab was happy to be part of the 'tree loom' project that integrated on site trees and the outside surroundings with two interweaving hoop warps made of fibre optics, monofilament and paper yarn. Two days of work, a lot of patience later and in the dark of the evening we had an active structure that other viewers were able to participate with weft weaving. 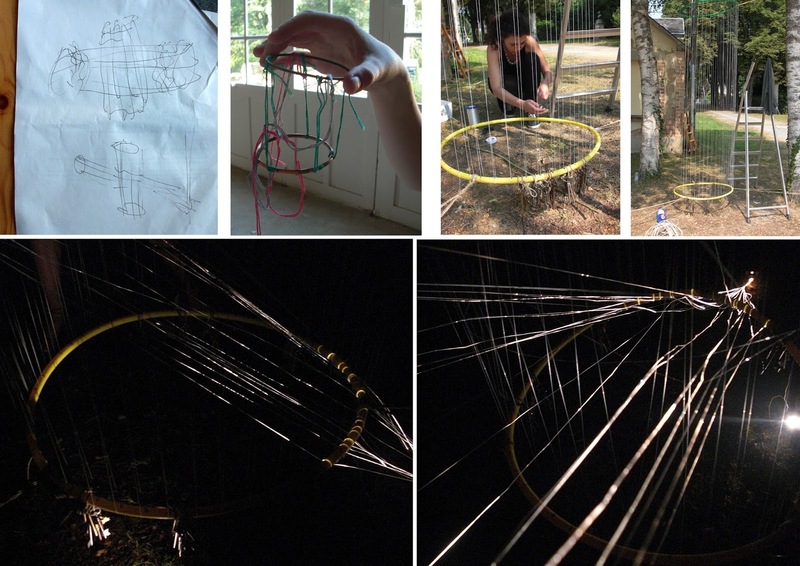 A great group collaboration (many thanks to Celine, Pauline, Isabel, Sarah T. and Beam). The event was a great success and a unique opportunity to have such a wealth of knowledge in the specific domain of e-textiles all in one place. It was inspiring to have got to know many of the other participants and to have been a part of such an event.